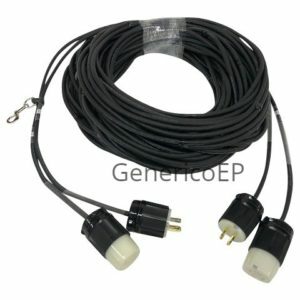 Generico dual twist- lok motor cables are assembled using two runs of 16 gauge SJOW type cable as standard. A snap hook is provided at the motor end to clip to the hoist chain bag or elsewhere as a strain relief. These cables can also be assembled with 12 or 14 gauge cable on the power side or both power and control legs at an additional cost. Pricing shown is valid for any style utilizing L14-20, L15-20 and L16-20 connectors. Please specify at the time of purchase. If you don’t see what you are looking for, please inquire and we will gladly assist.